Scholarship categories are listed below. The color-coded icons below make it easy to scan the page to find scholarships of a particular interest. Deadline: Check with guidance office for date. Generally due around mid-March. Deadline: High School: check with guidance office for date. Generally due around mid-March. Eligibility: Potter, Tioga, Elk, McKean, Cameron, Clinton Counties. High School & Non-Traditional. • Must be pursuing a degree in music field from any accredited college with a music department. • Preference given to piano majors, but other music majors will be eligible. To Apply: High school students must apply through their guidance office. For non-traditional students only – download application here with April 1st deadline. • Preference given to violin majors, but other music majors will be eligible. Category: General. Must be member of a music program. • Essay on "Why are you looking to engineering as a career"
Eligibility: All Elk County residents, or child or grandchild of Elk County Farm Bureau member. Eligibility: Elk County Residents. Graduating seniors and non-traditional students. To Apply: High school students must apply through their guidance office. For non-traditional students only – download application here. To Apply: Guidance counselor. Specific criteria. To Apply: High school students must apply through their guidance office. For adult learners only – download application here. • Must submit an essay, "Patriotism & Citizenship - What America means to me?" • Must complete an essay, "Who influenced me through the Military"
• Submit an essay describing where you see yourself in the future and how you plan to make a difference in the community you live. Also include his/her college and career goals. 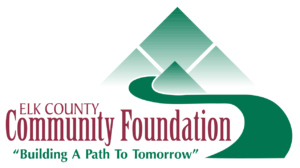 The mission of the Elk County Community Foundation is to strengthen our region through development, stewardship and grant making as donors achieve their philanthropic goals. Dr. Inez Stewart Bull was a woman of many interests and talents. Chief among her passions were music, music education and Norwegian-American relations, revolving primarily around her distant cousin, the world-famous violinist Ole Bull. The applicant must be pursuing a degree in the music field at any accredited college with a music department. Preference would be given to piano majors, but if one is not available other music majors will be eligible. Preference would be given to a student who has played in the Ole Bull Music Festival and/or the summer awards concert in New York City. One scholarship will be given annually. To qualify for this scholarship, you must be a graduate from a high school in Potter, Tioga, Elk, McKean, Cameron or Clinton County. Financial need is an important criteria for this scholarship and the applicant must be pursuing a degree in the music field.